the New England Quilt Museum. I mentioned the yellow house seen in several New York samplers. 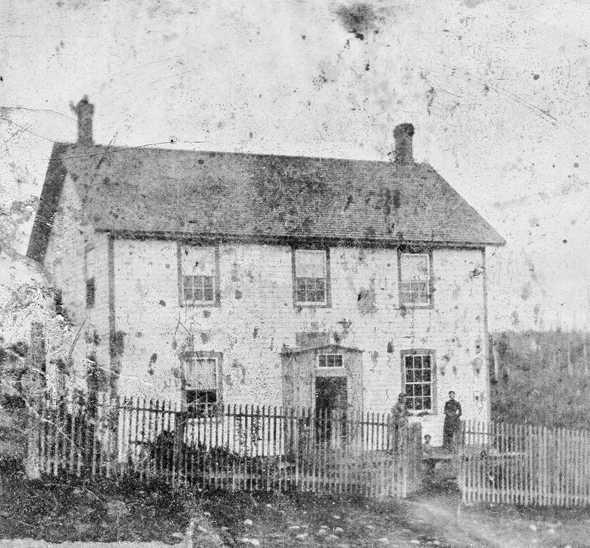 Common vernacular house style before the Civil War. 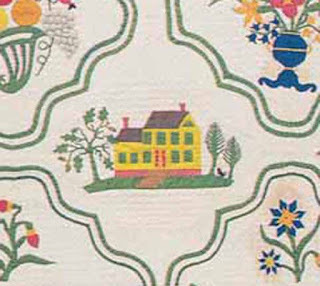 It could be a generic yellow house but it's not. It is a specific house. It has the gables on the ends, which defines it loosely as Greek Revival or Federal style. 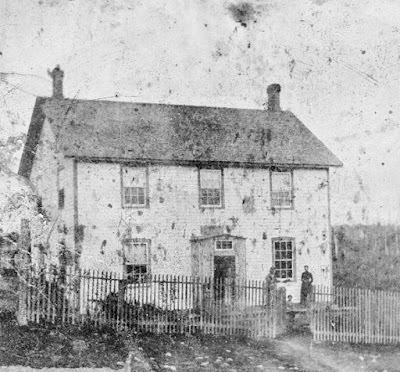 Three bays with windows above. 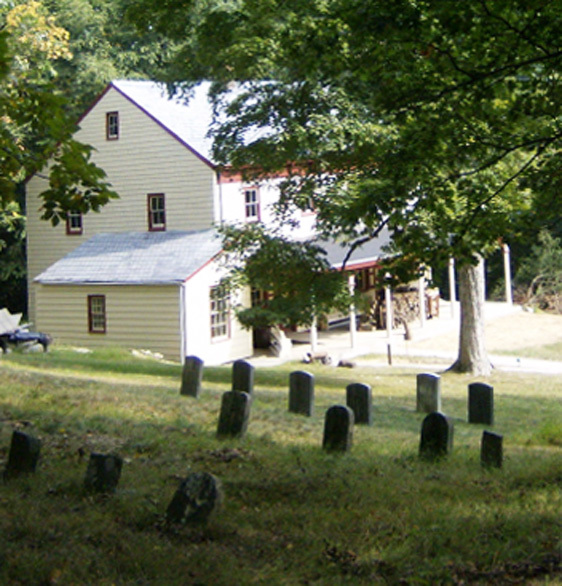 The house is surrounded by trees of various kinds. And sometimes has a gated fence in front. 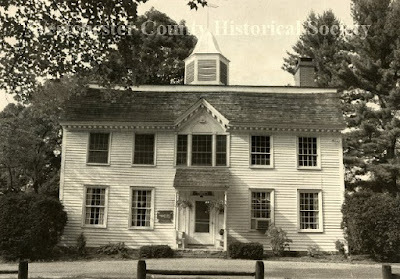 When viewed from the side the gable end has a third-story arched window. 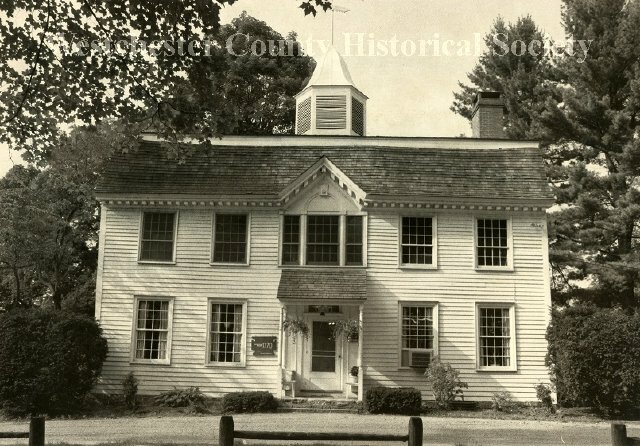 of Westchester County, New York. Mary married Ammi K. Close. 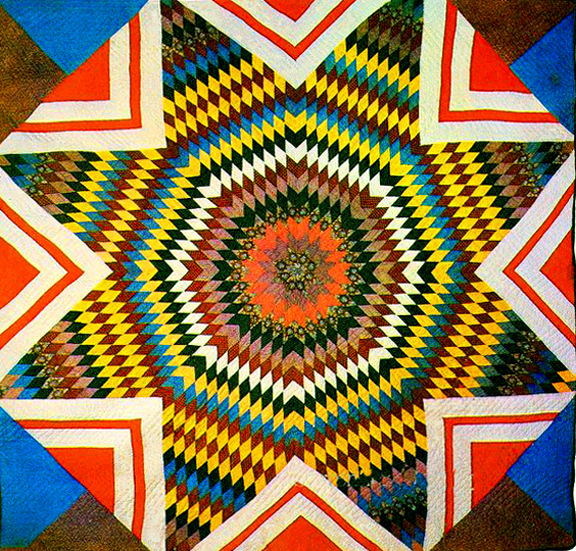 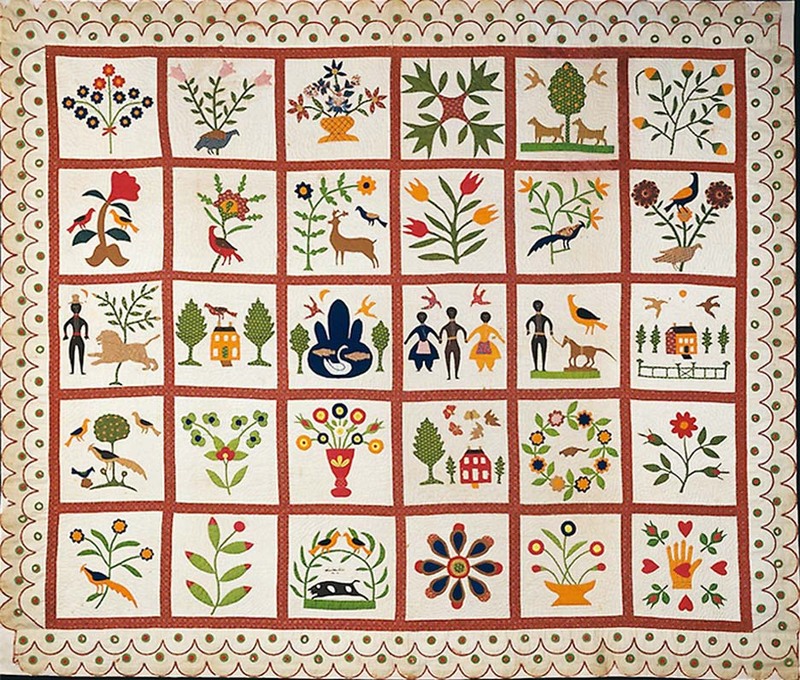 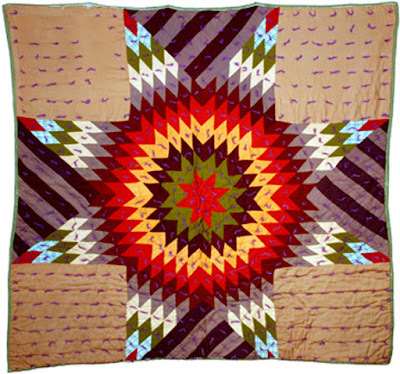 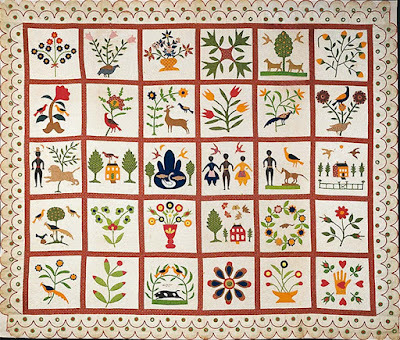 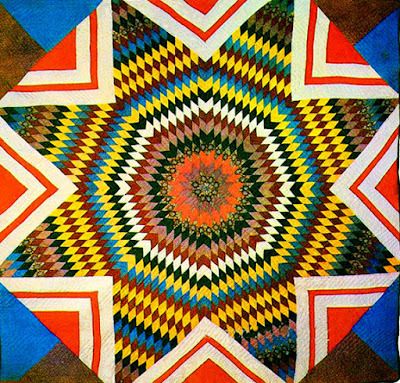 Her quilt, made when she was in her mid-teens, was documented in the New York Quilt Project and is in their book New York Beauties on page 68. 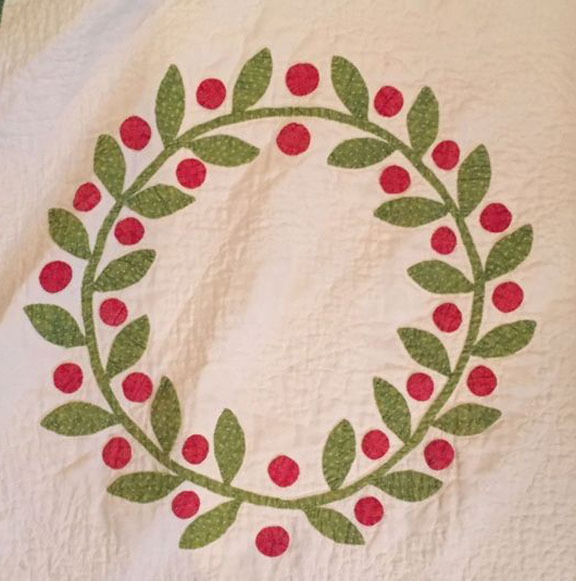 The family had a few details wrong. 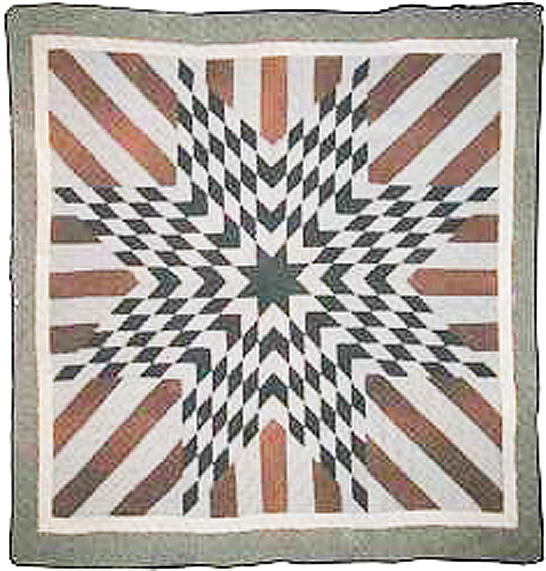 She lived in Ketonah and North Salem and she may have been born in 1833 and died in 1907. 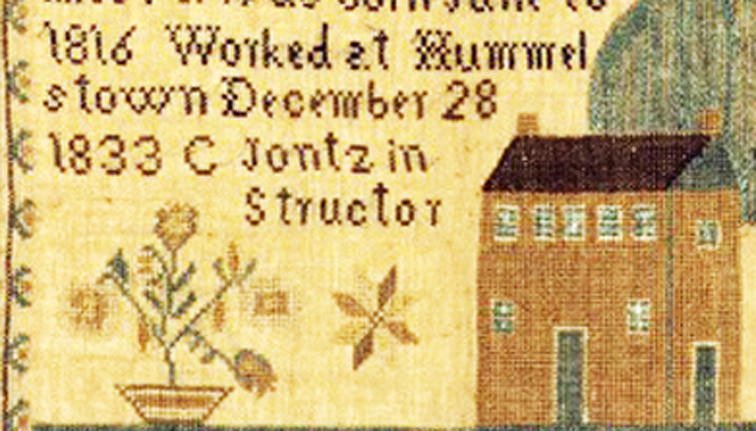 Could this recurring yellow building be a school, perhaps a school in Westchester County, New York, where a needlework teacher encouraged her students to finish off their quilts with double scalloped edges? 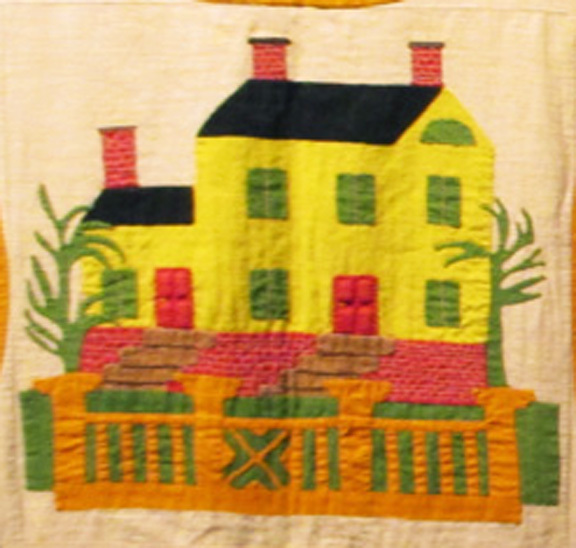 it's not the yellow house. 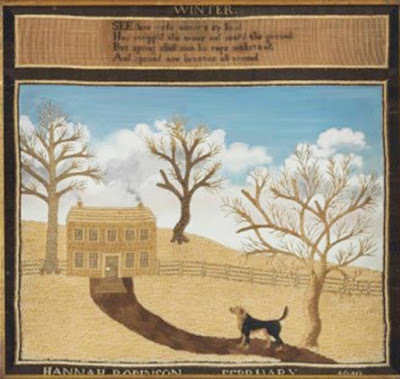 The idea of depicting a building, often a school, is quite common in embroidered samplers in England and the U.S. before the 1850s. 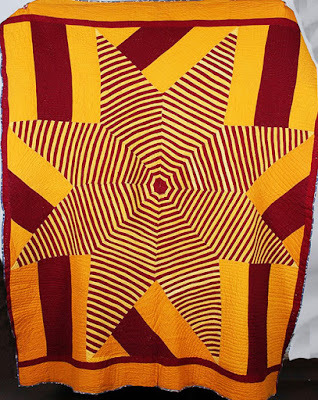 from Stephen & Carol Huber. 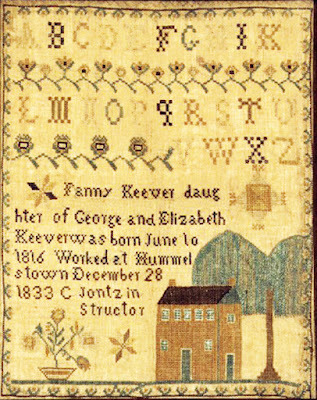 Fanny worked her sampler at a school in Hummelstown, Pennsylvania. 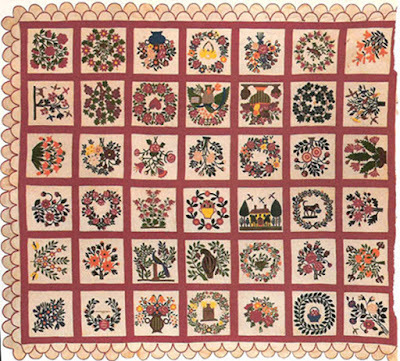 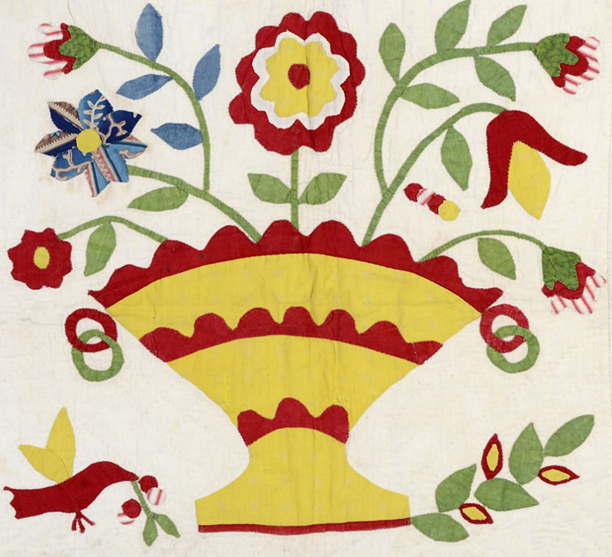 Sampler by Hannah Kelter Dec 17th 1835. According to dealers Stephen & Carol Huber: "Hannah wrought this sampler at Misses Robinsons' school in Montgomery County, Pennsylvania. 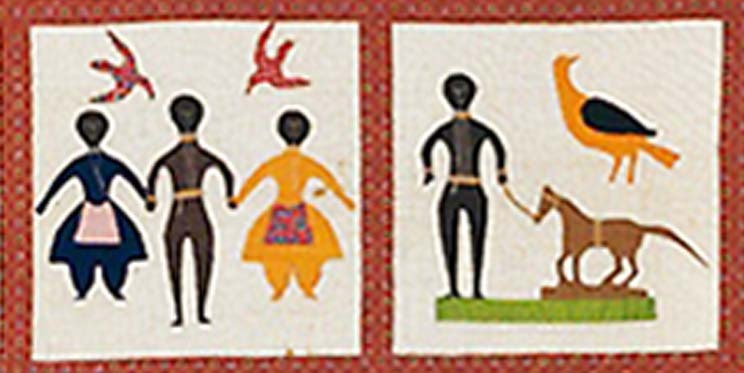 The Misses Robinsons' school was run by four unmarried sisters in their family home." Hannah Robinson's 1819 combination embroidery and watercolor. 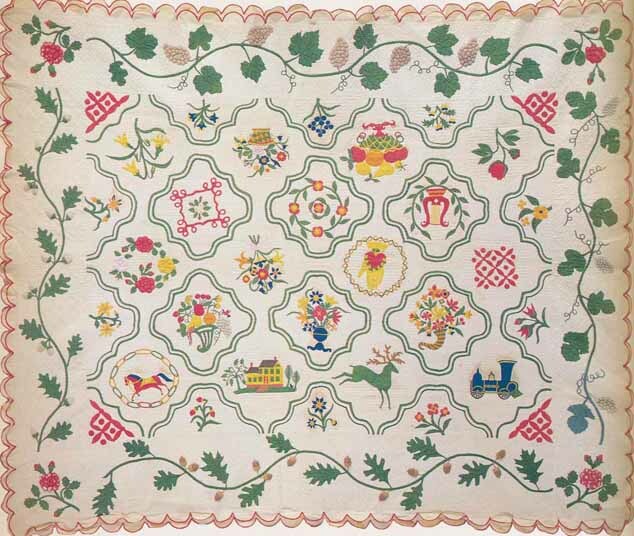 Collection of the Metropolitan Museum of Art. 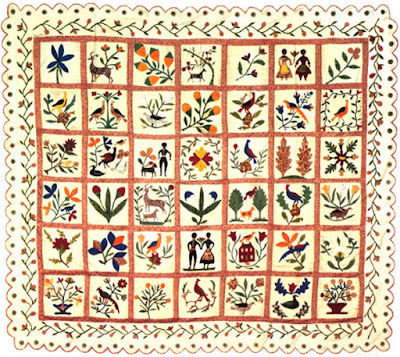 Sampler historians often categorize samplers by school. 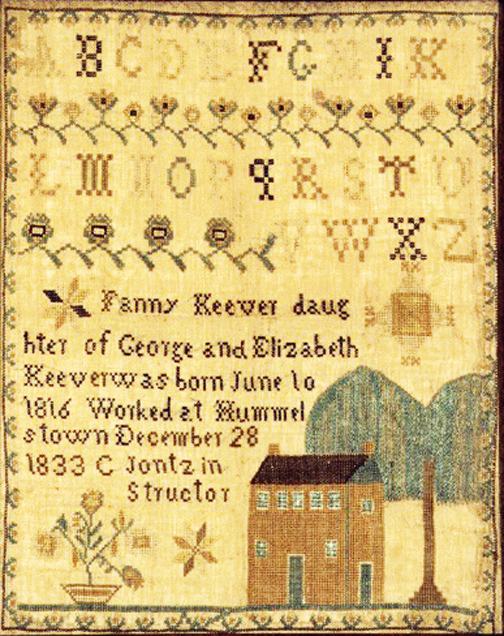 The Robinson sisters' needlework school was in Upper Providence, Pennsylvania. 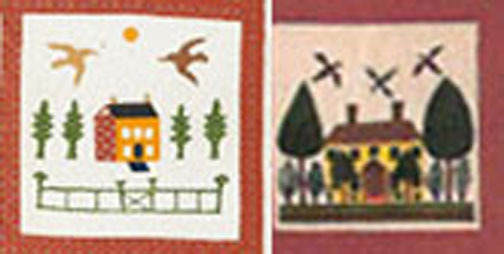 Colonial Williamsburg counts eight samplers from the Robinson school. 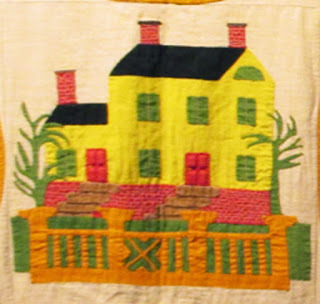 The National Society of Colonial Dames has a register of teachers and schools for research into needlework but I didn't see any likely places for a yellow house in Westchester County. 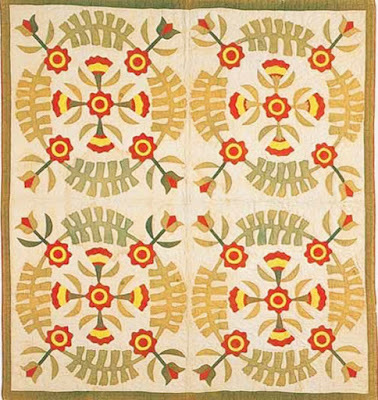 Fans of antique quilts are familiar with this pictorial quilt with its double scalloped edging and red sashing. 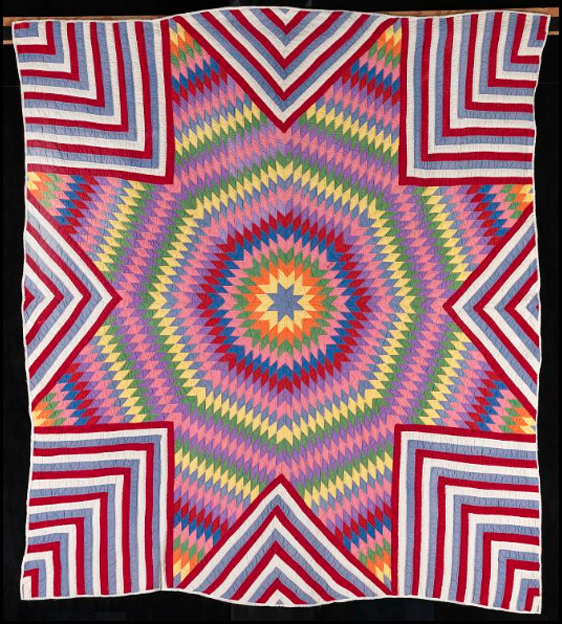 It's been published several times over the past forty years and it's been in the collection of the Art Institute for about twenty. I've always liked the dots on the red and green scallops. 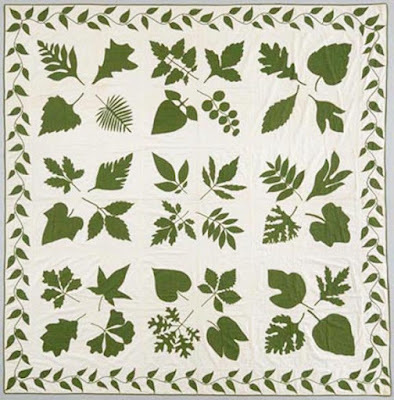 I knew I had seen several pictorial sampler quilts with that fancy scalloped edge and I now find I have pictures of four. five. 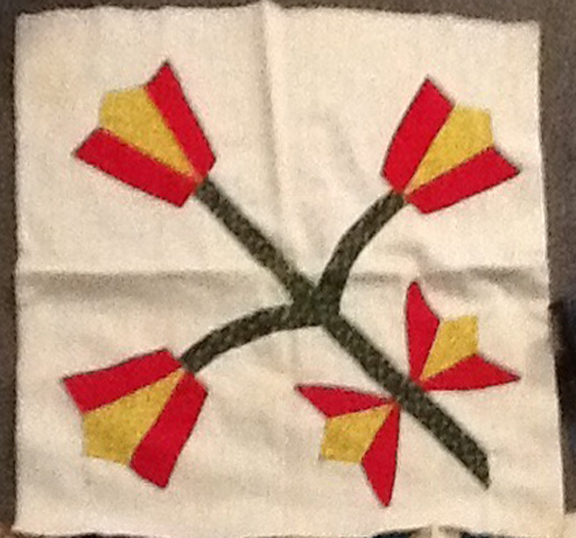 This one has two scallops too but no dots. Collection: National Gallery of Art. 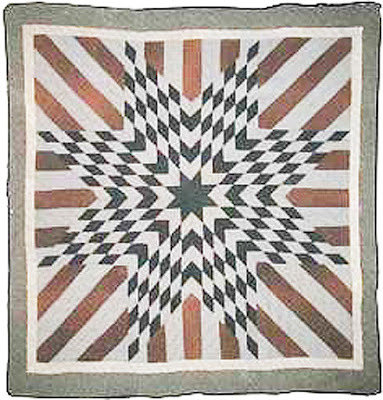 Quilt found in New York City. 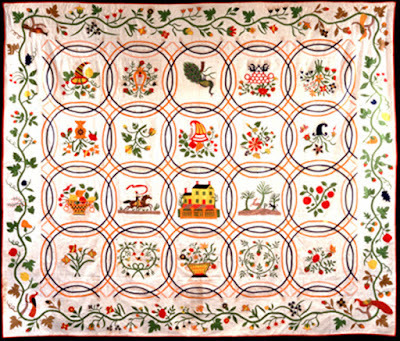 a folk art object. 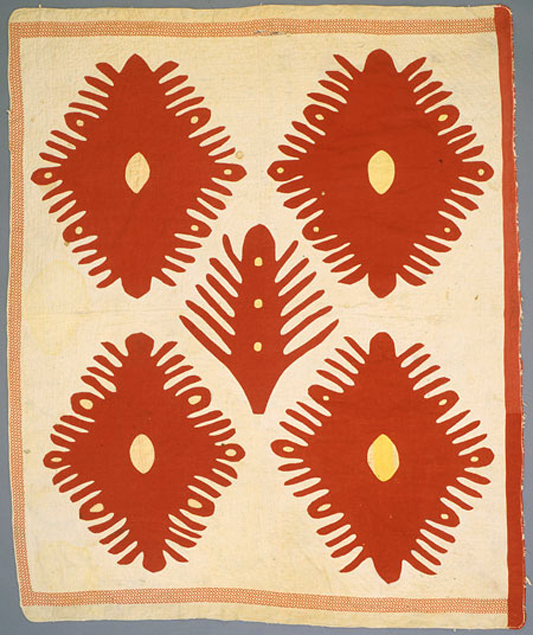 It has a single scallop with dots. The National Gallery had noticed the similarity to Quilt #1.
but the double scallop is intriguing and it's from New York. 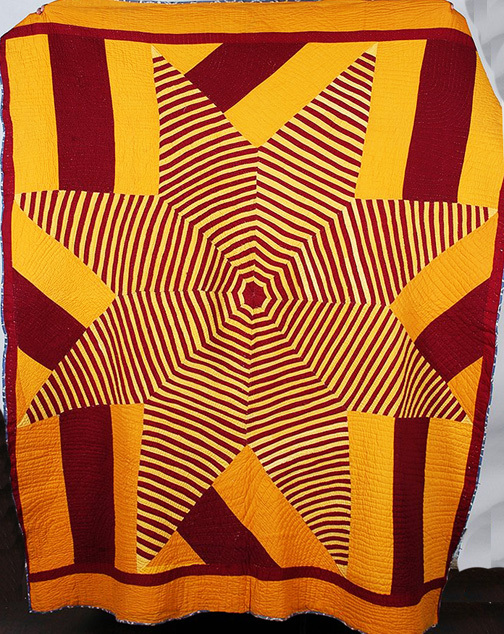 Quilt #5 is not quite so similar. 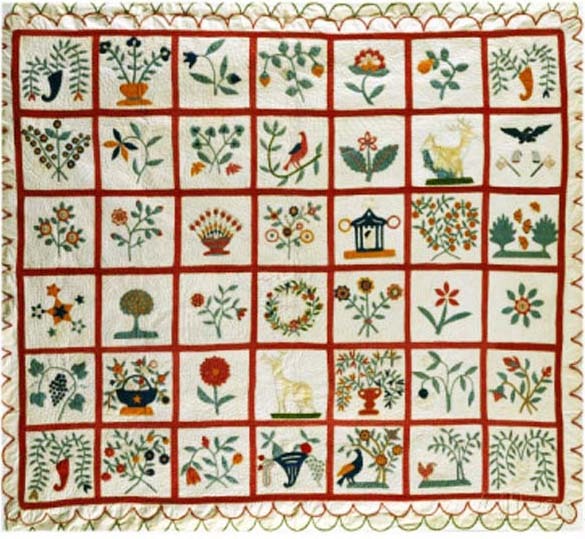 These five quilts share numerous style characteristics. 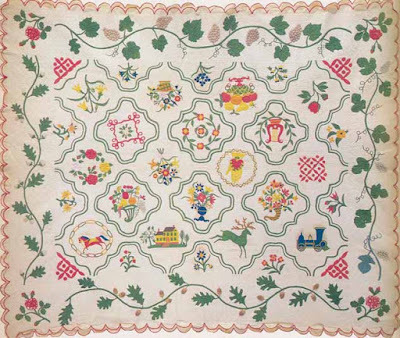 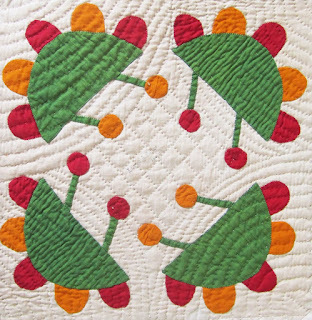 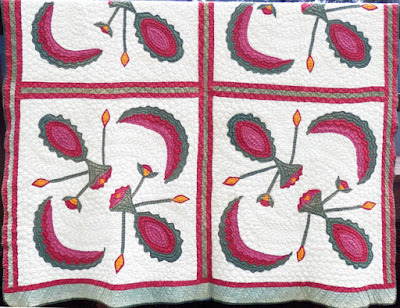 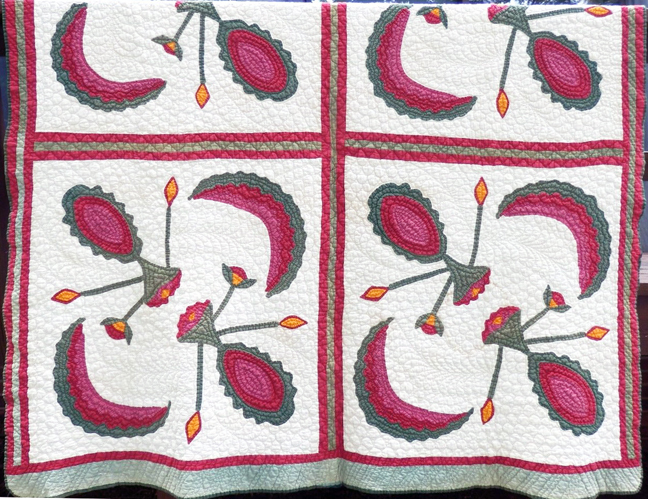 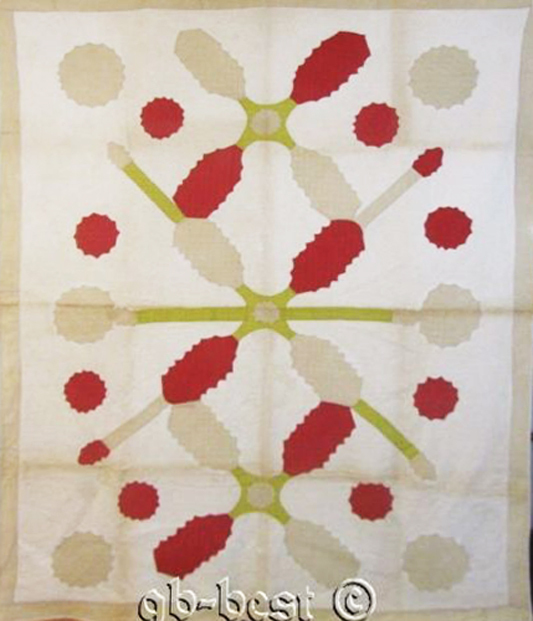 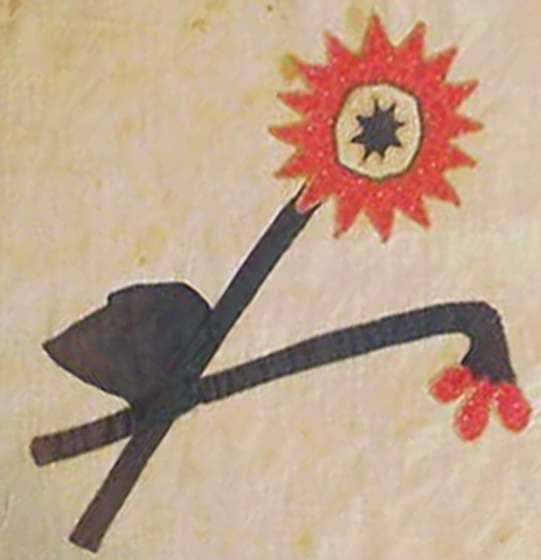 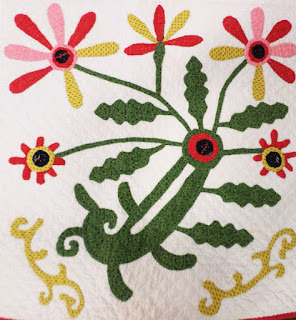 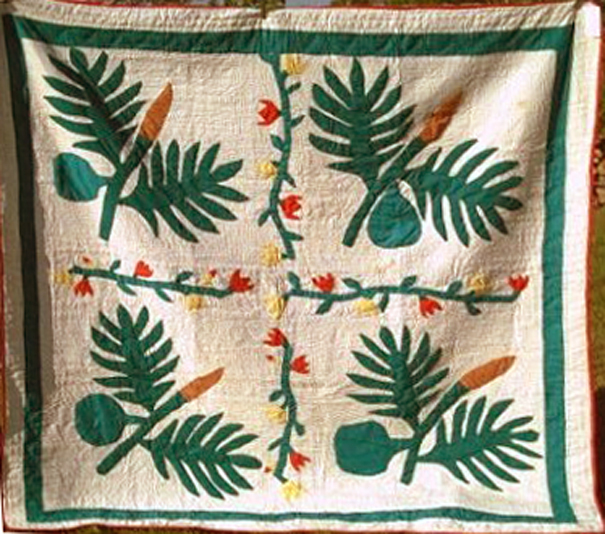 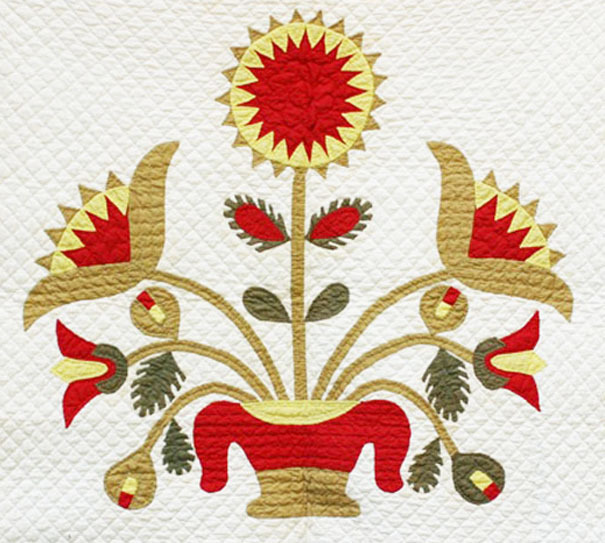 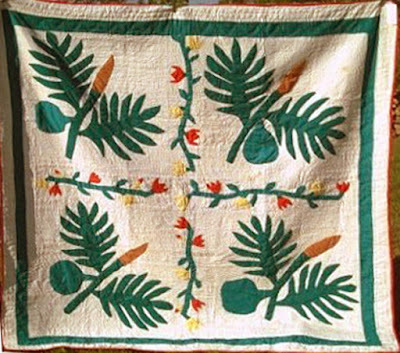 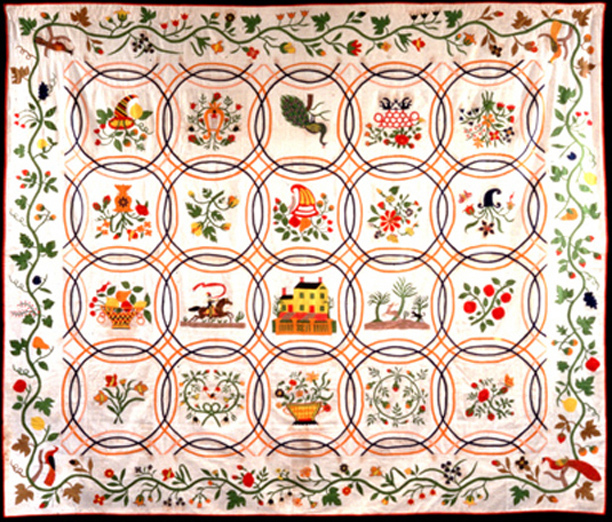 The blocks are not only flat stylized applique, rather isolated in the center of each square, but the quilts share similar conventional applique designs like this 8 lobed floral. 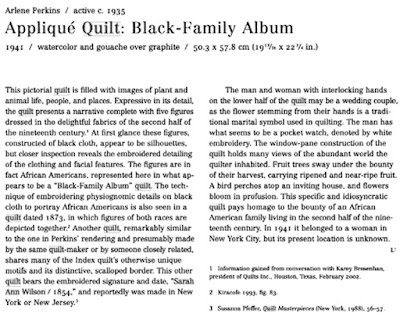 And mainly more unusual pictorials. Yellow houses with birds and pairs of trees. 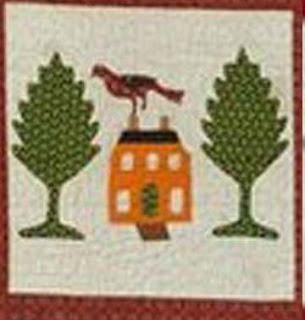 #5 also has a yellow house and a bird. 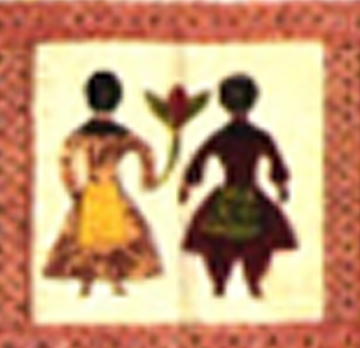 with the women in aprons in #1 and #4. 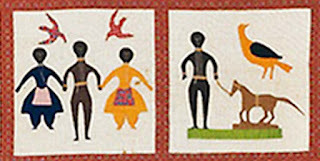 The figures apparently have facial features embroidered so it does appear that they are not meant to be silhouettes but black characters. 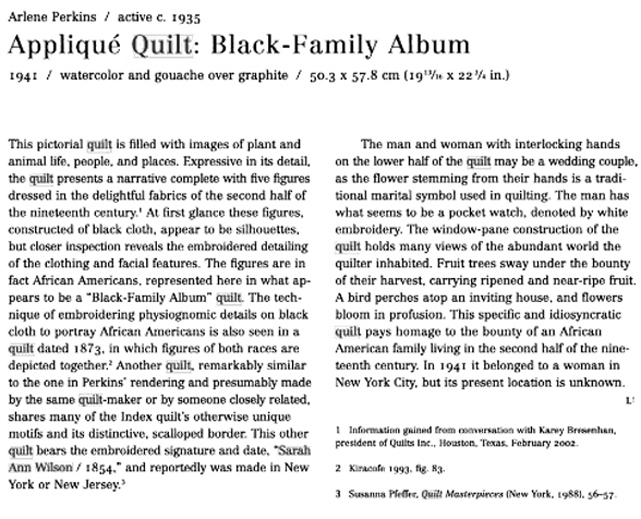 Black stereotypes were typical in all kinds of imagery so this does not tell us the race of the quiltmakers. 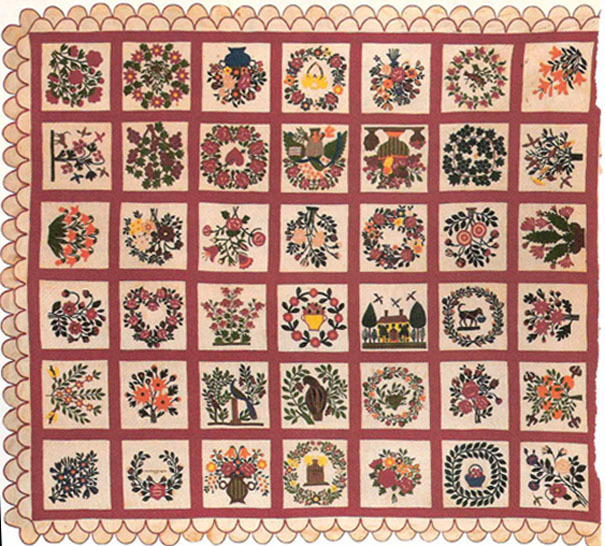 I found a little about Anna Putney Farrington who was born in 1820 according to the cemetery records and thus about 34 when she made her quilt. 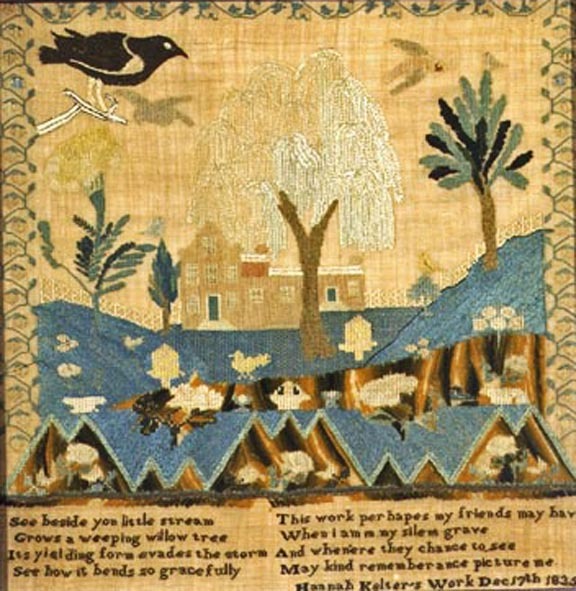 Her husband was Hiram Farrington (1830-1906) and they are buried in the Amawalk Friends' Cemetery in Westchester County NY. Sarah Ann Wilson is harder to find, but I bet she's from New York too, maybe Westchester County. 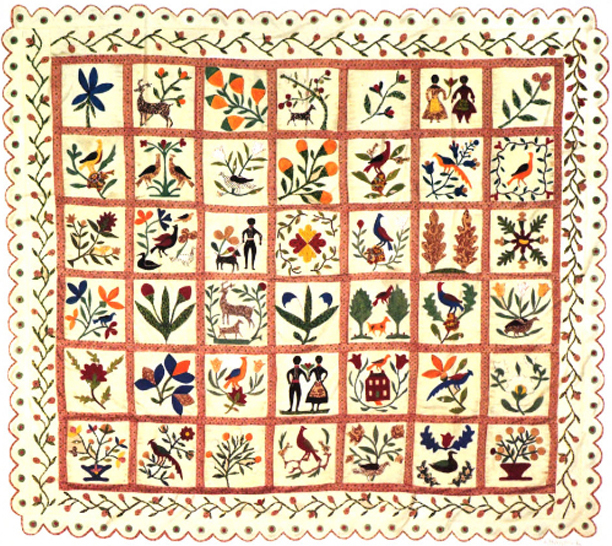 What was going on in New York in the 1840-1860 period? 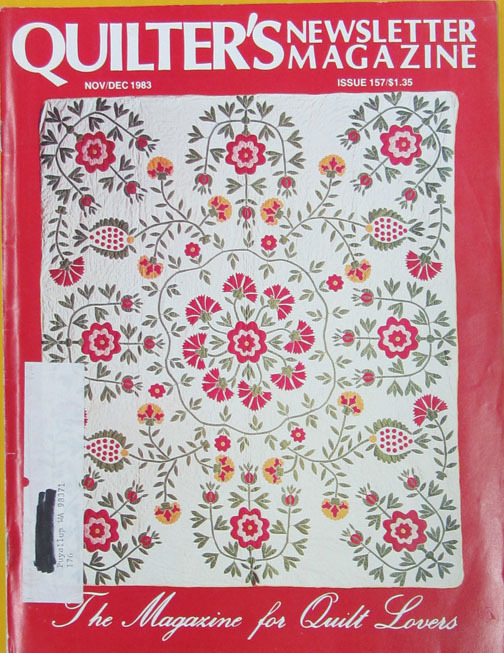 Were people selling patterns? 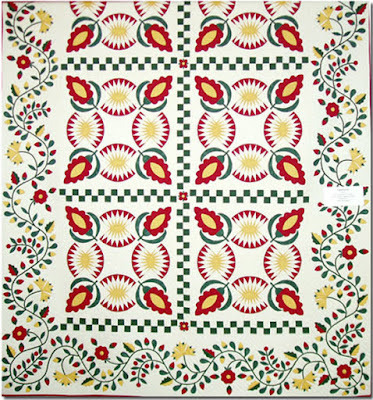 Making kits? 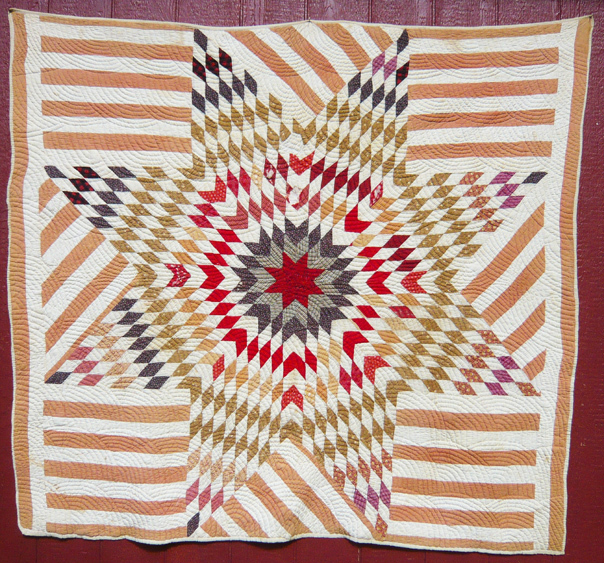 Showing off their quilts at fairs to inspire copies? Teaching classes? 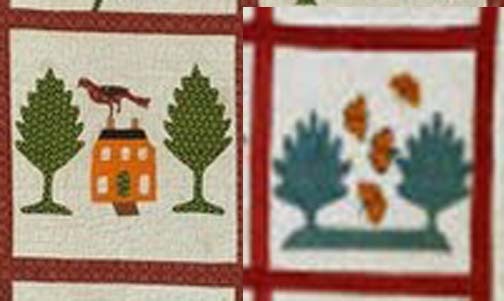 Was that yellow house a school? 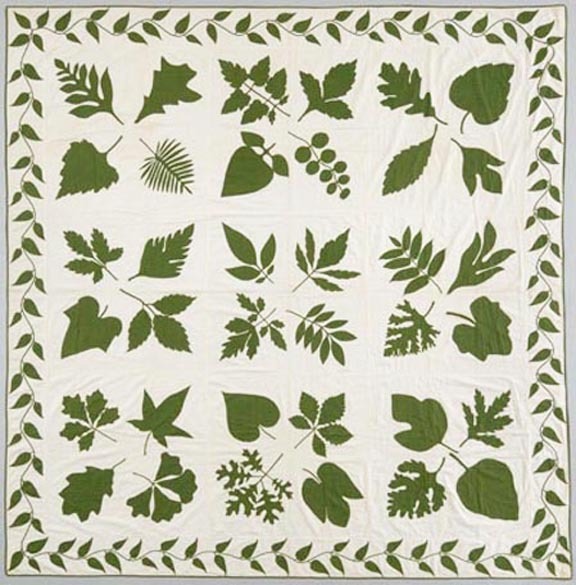 adapted nature to their quilts? Using simple shapes they captured the natural world. 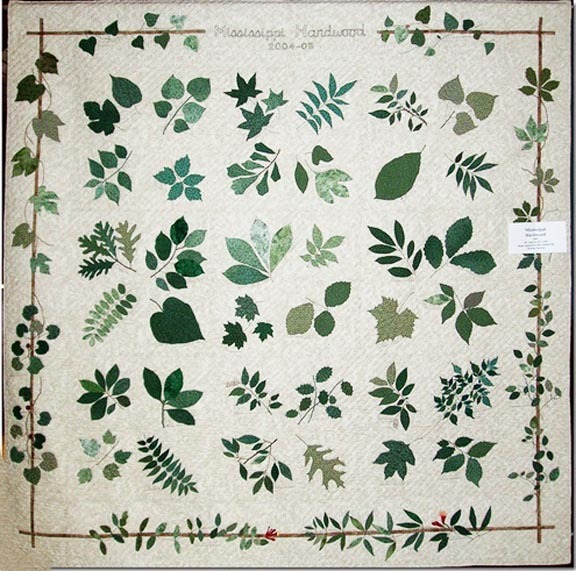 a real talent for abstracting nature. 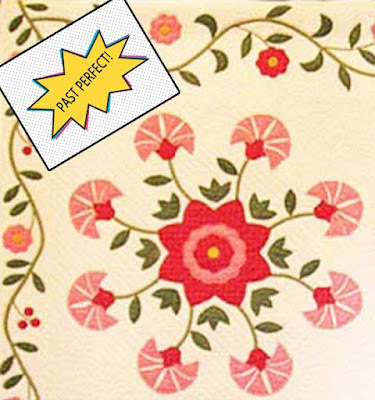 Well, not everybody's at one with nature. 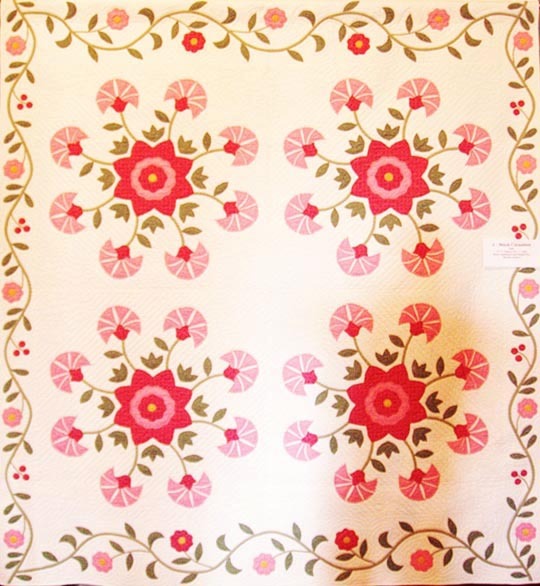 was Mississippi's Queen of traditional quilting. cleaned up in the handwork category. 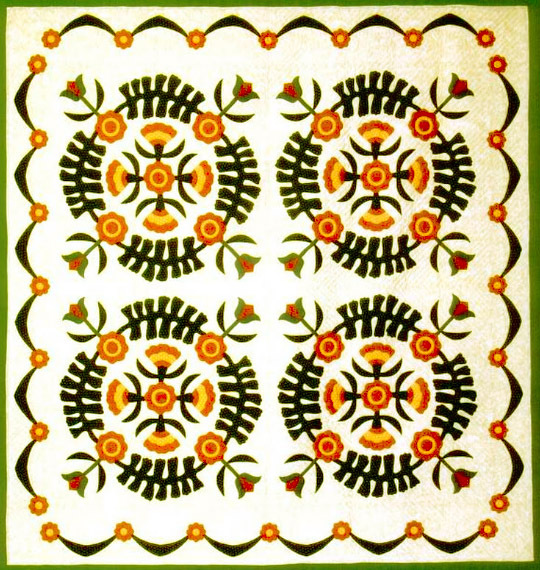 Her inspiration was often Southern regional design. The carnation above was probably drawn from a Garrard County, Kentucky quilt, maybe this one on the cover of Quilters' Newsletter in 1983.
in Paducah in 1987 with this one. 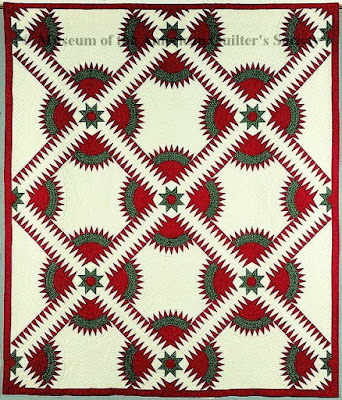 Mattie Peden of Kemper County, Mississippi??? 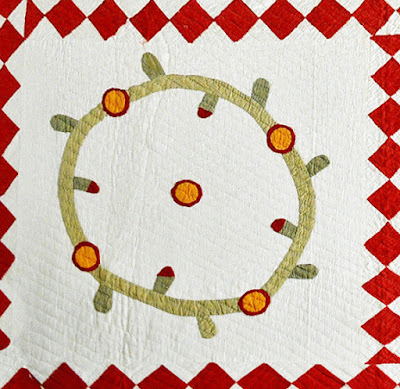 Born in New Martinsville, West Virginia, a resident of Vicksburg since 1947. 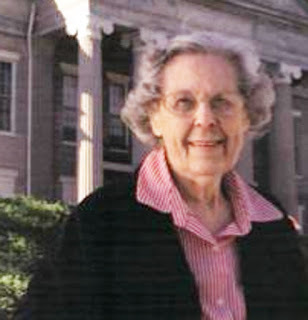 She was 89; a graduate of the University High School in Norman, Oklahoma and received her degrees in Geology and Library Science from the University of Oklahoma. After moving to Vicksburg, she was Librarian at H. V. Cooper High School for a number of years. 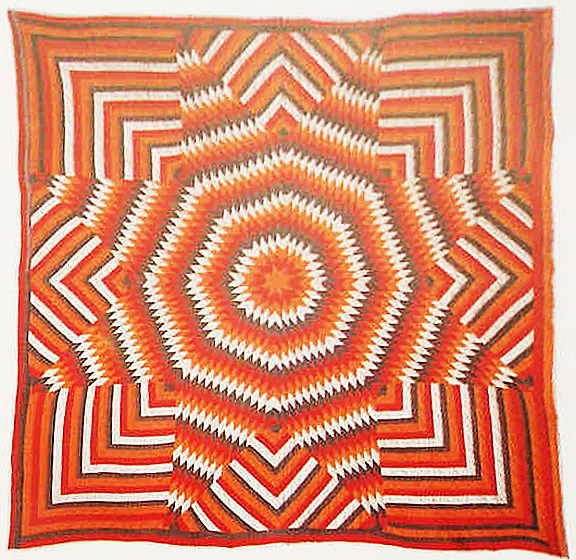 A book [about her] by Mary Elizabeth Johnson, from University Press contains photographs of 90 of the 200 quilts she completed. 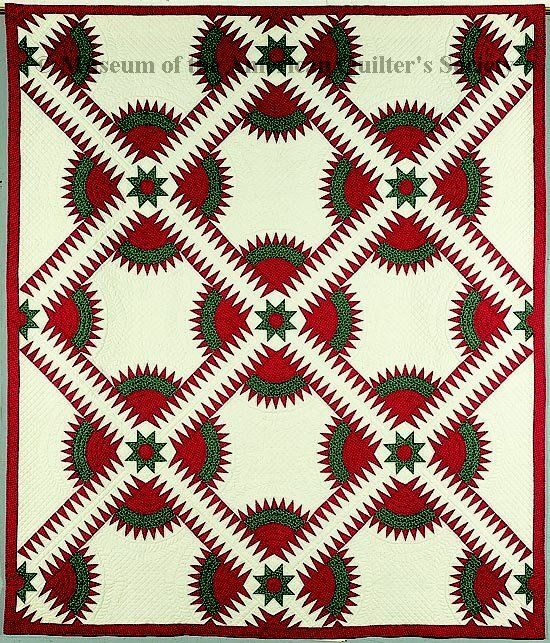 Mrs. Skelton was selected twice to participate in the Smithsonian Institution's Folklife Festival and was instrumental in establishing quilting as a program for the Mississippi State Fair. 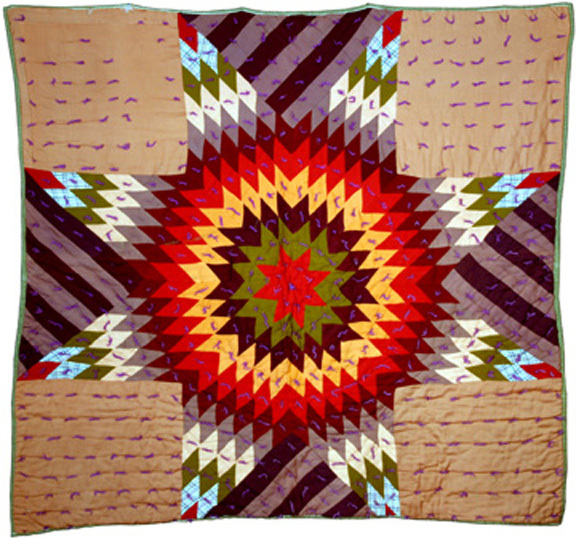 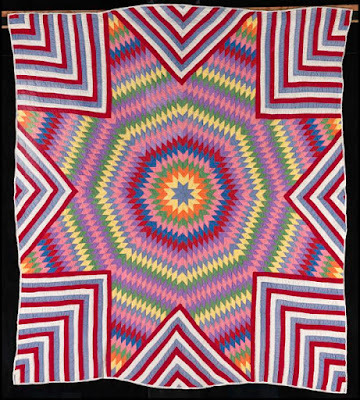 Her quilts are in the permanent collection of the Museum of the American Quilters Society and the Mississippi Department of Archives and History Collection. 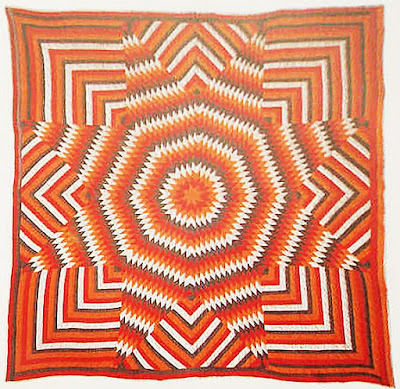 Ninety of Martha's hundreds of quilts are pictured in the book Martha Skelton: Master Quilter of Mississippi by Mary Elizabeth Johnson. DWR 4: An Older Design Source? 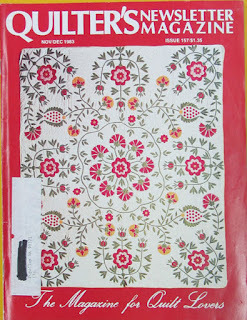 DWR 3: Source of the Design?